Knowing the symptoms of skin cancer could very well end up saving your life because as you may already know, early detection is the key to successful treatment. Even though many people tend to view skin cancer as a relatively mild type of cancer, you need to bear in mind that it is the most common type of cancer in the world. Fortunately however, unlike many other types of cancer, skin cancer can almost always be cured providing it is detected in time. In the vast majority of cases, early detection results in a successful cure, and this is why it's so important for people to be able to spot the symptoms of skin cancer as soon as possible. Fortunately for us, there are usually several distinct symptoms which could suggest that there is skin cancer present. If you have any moles, spots, or even birthmarks on your body then you should pay special attention to them, and you should make sure you examine them on a regular basis. If you happen to notice any unexplained changes such as an increase in size, a change of shape, or even a change in color, you need to go and see a doctor immediately. You should familiarize yourself with the "ABCD" rule. Generally speaking, this rule involves you examining the asymmetry, the border, the color, and the diameter of any moles you may have on your body. If you notice a change in any of these four aspects, it could be an indication that you have skin cancer, and in that case, you need to make an appointment with your doctor as soon as possible. Some doctors also tend to favor the "ABCDE" rather than the one mentioned above, although of course, they are both identical apart from the fact that this one includes the letter "E" which stands for elevation. 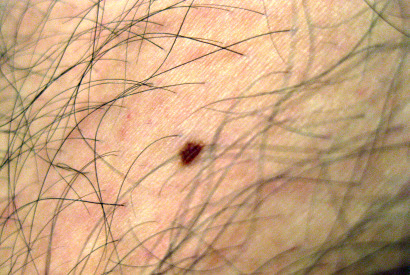 Generally speaking, if a mole is not cancerous and it should lie flat against the skin. On the other hand, if you notice the height of a mole is increasing then it is also reason to be concerned. If one of your moles suddenly starts developing an unusual type of crust, or it begins bleeding for no apparent reason, then you need to go and see your doctor. Even if you notice a clear, colorless discharge then there is also reason for you to be concerned. Unlike in the early stages, pain may be experienced once the disease has begun spreading, and in most cases, the pain will be present in the immediate vicinity and perhaps also in the surrounding area. Other symptoms of skin cancer in the later stages could include swollen lymph nodes in the neck, armpits, and groin region. The disease can also result in weight loss although this doesn't always seem to be the case. Additionally, sufferers may also develop a persistent cough, frequent headaches, and even seizures. Of course we all hope that we'll never come face to face with the symptoms of skin cancer , but in the unfortunate event that you do, you need to see a doctor as soon as possible. In fact, one should actually see the symptoms as being a blessing in disguise, in that they make it possible for you to go and seek help in time so that the disease can be treated successfully.